We only gave ourselves a single day to explore Padre Island National Seashore. I am sure folks who love this place dearly are appalled that we didn’t take the time to settle in to the rhythm of the waves, and to really enjoy the longest stretch of undeveloped barrier island in the world. Padre Island is truly a national treasure, one I had heard very little of until recently when I found bloggers talking about their time volunteering on the island. North Padre Island is a bit different. Technically it is a neighborhood of Corpus Christi, with many upscale seasonal homes on the intracoastal waterway, surf shops, and all that go with that beach resort kind of atmosphere. Unlike what I read about South Padre Island, North Padre Island seems to be a bit more laid back, not quite so crowded, maybe not quite as popular with the spring break crowd. Very few high rises were to be seen. Just a few miles south, however, is the entrance to the national seashore. The entrance is still a few miles from the visitor center at Malaquite Beach, and the broad expanse of the barrier island seems a bit featureless until time is taken to look at it a bit more closely. Camping is allowed both in two main campgrounds that are accessible by road, and along the entire 65 mile length of the shore with a park permit. There is an additional campground at Yarborough Pass at milepost 15 ( through the dunes) that is on Laguna Madre, inland from the beach, and is accessible by 4 wheel drive or by boat. 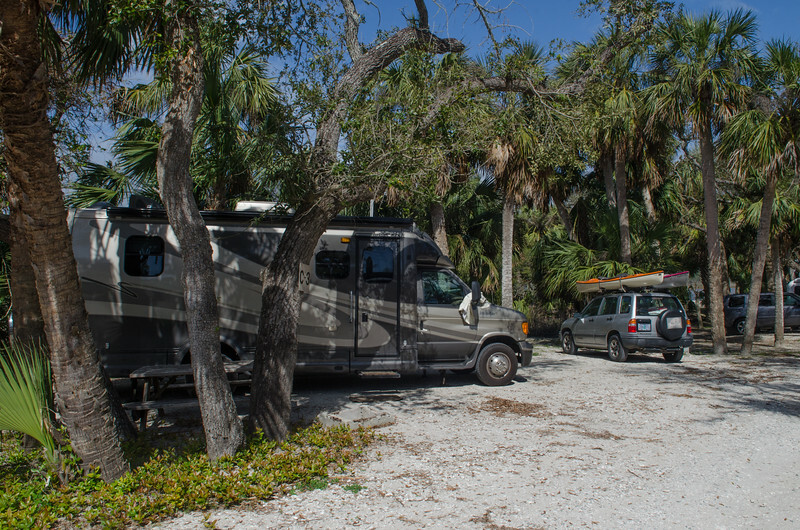 We decided to drive to Bird Island and discovered one of the campgrounds, with several rigs settled in along the silty beach bordering Laguna Madre. It was here that I first saw this very weird bird that I later discovered was the national bird of Mexico, a crested caracara. There were white pelicans settling in on an exposed bar in the lagoon, and the wind was blowing hard. Perfect for windsailing, which seems to be a popular pastime at this site. Continuing down the road toward the visitor center, we found a short interpretive trail with a nice path that led through the grasslands. The ecology of a barrier island is complex: simplified it consists of the beach, the dunes, the grasslands, the wetlands, and the lagoon separating the island from the mainland. The grasslands are full of all sorts of plants and wildlife, and we saw the lovely vermillion butterfly.The weather was cool and windy for our walk, and the sun was brilliant. Dog friendly beaches and trails were another great surprise about the seashore. We were happy to have Abby with us all day on the trails and on the beach, although even with pavement, there were many stickers on the trail that Mo had to pull from Abby’s paws. Again, the national seashore is almost 70 miles of coastal frontage with no roads providing access. The only access is in your vehicle, right on the beach. The first 5 miles don’t require a 4 wheel drive, but it is recommended after that distance, due to drifting dunes that build up along the route. The warning sign at the 5 mile marker regarding illegal activity and smugglers was a bit sobering. We drove about 10 miles, most of the time we were the only ones on the beach, and it was very windy and cool enough that we were grateful for the protection of the car. This landscape is a place where immersion would take commitment. It would be wonderful to take the MoHo as far as we could manage and just sit there and watch the water and the view change with the shifting light. Instead, it was an exploratory trip and we decided that we will definitely return to explore it in depth. Shoreline trash is a big enough subject that it is directly addressed in the park brochure. Seems as though most of the trash is blown in from the Gulf and there are both public and private programs to try to clean it up. It would be a never ending project. An entire day could be devoted to picking up all sorts of flotsam and jetsam that must be dumped from ships or who knows where. It was a shocking, actually. More trash than I have ever seen on a beach anywhere. In an nearly pristine wilderness. Trash bags are provided at the access roads to help with the garbage pickup. Made me really sad, and yet overwhelmed enough that I didn’t fill a garbage bag and try to take it back. Sorry Erin. I did manage to pick up a lot of trash at the NAS beach. Unlike the complex, ever changing coastline of the Pacific, this gulf shore feels infinite…going on and on what seems like forever, with very little change. The subtle differences would have to be experienced at a slower pace. As nesting grounds for the endangered Kemp’s-ridley turtles, there would be nests to watch for as early as April, but with the chill winds, we saw no sign of turtles. The story of the Kemp’s-ridley turtle is fascinating. Nearly extinct, they were losing their nesting sites to development, so biologists put Padre Island sand in their incubators to help them imprint, released them after tagging them from the shore, and recently tagged turtles have been returning and nesting in what was not an original nesting site for them. Although five different species of sea turtles nest on the island, we saw no nests and no turtles. Still too early in the season, I am sure. In spite of the chill wind, seeing that expansive shoreline was fascinating, especially for me as a westerner with a Pacific ocean mindset. I loved it. Loved that I could just walk and walk and walk if I had the opportunity. I would imagine we will return to this place again and continue our explorations. We waited for several days for the winds to lessen enough to launch our kayaks, and on our last day in Corpus Christi were rewarded with a calm not so chilly morning. There was a bit of fog to accompany us as we drove once again across the bay toward Mustang Island and turned north toward Aransas Pass. We read about the Mustang Island Paddling Trail, where there are several launch sites, and official markers for the trail. Being inexperienced in this area, it seemed like a good idea to try a marked route. The trails are on the bay side of Mustang Island, in brackish water that has a very silty, muddy bottom, dotted with islands and inlets. If you have ever tried to navigate in a completely flat landscape filled with water, you can imagine how challenging it was to figure out where we were. I didn’t have the official GPS with me, just a good printed map of the trails, and the google earth imagery. Sure am glad I also had the phone GPS. In spite of my reasonably good navigation skills, I had no clue where we were on the map without turning on the phone and trying to figure out where that blue dot was! It was fun, not too windy, and there were enough birds around to keep things interesting. I was quite delighted to finally find the route marker number 11, and then number 10. We had completely missed the rest of them. It isn’t a difficult place to keep track of where you need to go, it just is a bit tricky avoiding lagoons that might dead end into mud without an outlet. We probably paddled a short five miles or so, in water that wasn’t the least bit exciting and very very shallow in many places. Still, it was good to get out in the kayaks for a morning at least and experience a bit of Texas water. As mentioned in the previous post, we topped off our morning kayak with our fabulous afternoon with Erin and Mui. It was a great way to spend our last day in this area that was brand new to us until now. I especially enjoyed trying to photograph all the birds. As they say, the best equipment in the world still needs the photographer. In spite of Deanna’s great lens, I have a long way to go before I get those shots of their eyes in perfect focus. I’ll keep trying.